David Wayne Reed on his family's farm in Louisburg, Kansas. Once, his dad asked him if he wanted to be a farmer. Reed replied no, he wanted to be a backup singer, a stripper and an artist. He grew up to be an actor, writer, playwright and a storytelling event producer. And he can now add filmmaker to his resume. His first film, "Eternal Harvest," which premiered last weekend, has brought him back to his farming roots. Those roots run deep. He described his great-great grandfather as the “original Rockefeller” of Louisburg. When a steamboat went down in the Mississippi River, the elder Reed got the engine, refurbished it and used it to run the first mill and grain elevator in town. He also started what became the first bank there. 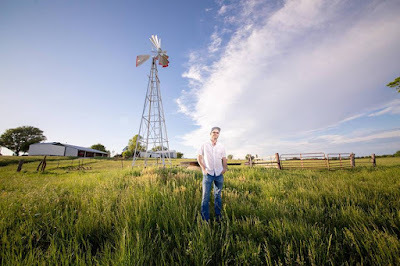 Though his mother and father still live on the farm that's been in their family for generations, Reed was ready to leave Louisburg after graduating from high school. He headed to Emporia State for a year, where he had a theater scholarship. He then transferred to Kansas State to study journalism. A friend suggested that he check out K-State’s theater department, and he changed his major junior year. At K-State, he learned the technical aspects of acting. The theater program also allowed him to have a social life that he didn’t have before, he said. “I just wanted to be in front of people. I just wanted to connect with people,” he said. “Growing up on the farm, it’s kind of lonely. Your only social outlets are going to church or going to the funeral home; that’s what it felt like to me. When he graduated from K-State, he wanted to go to Los Angeles to pursue acting. He ran out of money in Truth or Consequences, New Mexico, and he said he had to return home with his tail between his legs. Back home, he’d go to the silo to sing and to shout out Shakespearian monologues. “I would just sing my guts out in the silo every night because the acoustics were so good,” he said. One day, he saw an audition notice for a play called “The Birds.” The group behind "The Birds" later became Late Night Theatre, a gender-bending theater troupe in Kansas City. When Late Night Theatre started out, it was an all-male group that did send-ups of famous movies such as "The Stepford Wives" and "Valley of the Dolls." Reed learned how playwriting and dramatic structure worked by studying these scripts. He then adapted his first play for the Late Night Theatre stage: “Come Back to the 9 to 5, Dolly Parton, Dolly Parton," his send-up of "9 to 5" and "Come Back to the Five and Dime, Jimmy Dean, Jimmy Dean." He also mined his personal history for the “Mother Trucker” plays. As a result, opening night was an emotional experience, he said. “I remember the audience applauded and stood up,” he said. “And I went out to the back alley of the theater and I just wept. I couldn’t even go out for the encore. That marked a turning point for Reed. His work became even more personal. He put together his one-man show, “Jolly Rancher,” while doing an artistic residency in Seaside, Florida. The show, which included stories from his life on the farm, made its debut to a community of strangers. With "Eternal Harvest," he returned back to where it all started. “It documents the cycle of life told through a farmer’s eyes,” he said. Filmed on his family's farm, it features his father and shots of his grandmother's quilts in kaledoscopic patterns. Reed said he purposefully tied his writer’s hands behind his back to communicate solely through visual language. Making the film on the farm felt like coming home, both literally and creatively. I gave birth on Mother's Day weekend. 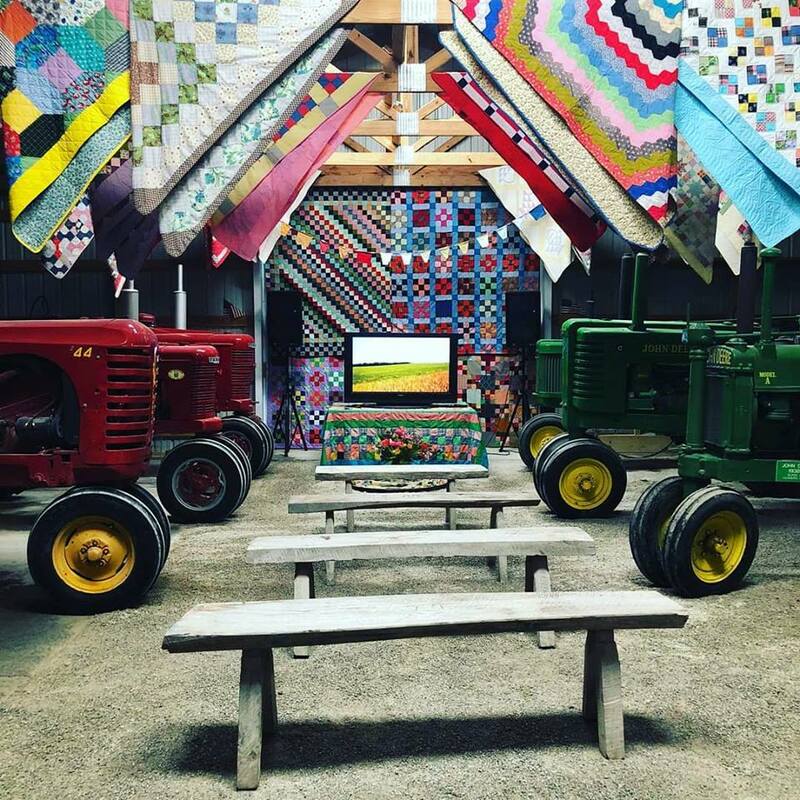 My short film, Eternal Harvest premiered in my Dad's tractor shed in Louisburg, Kansas as part of the Miami County Farm Tour. What a labor of love it was. Over 300 people came to the farm to visit and to experience this sanctuary and film. I'm overflowing with gratitude. Eternal thanks, in fact.